It was a warm summer afternoon, the calm Cornish coastline was a welcome sight after 4 days of non-stop sailing from The Mersey. I went to my bunk, finally off watch, smiling in the knowledge that home was just around the corner. In an instant everything changed, the gentle lapping waves were drowned out by the most ferocious roar; I could barely hear myself think… This could only mean one thing; my wife had arrived with my lunch!!! 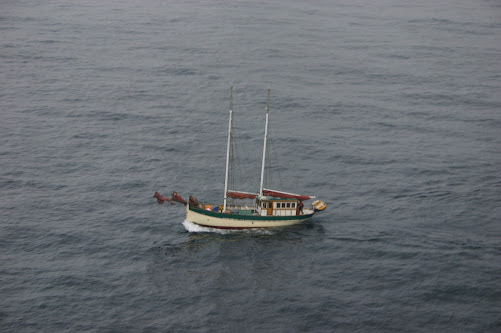 I was on a yacht delivery, aboard The Annette, a 60 ft Gaff Schooner, from Manchester to Falmouth. I had arranged a training exercise with my wife, who is a Royal Navy Helicopter Pilot for 771 ‘Search and Rescue’ Squadron. She spends her days ensuring that sailors like me are protected in the event of an emergency. The Royal Navy were glad to take the opportunity to carry out some valuable Hi Line training with a private yacht, and the owner who was on board thoroughly approved of the idea! As a Yacht Master Instructor I jumped at the chance to experience first hand the process that I so regularly try to explain to my students. As I climbed up into the wheelhouse of the 1908 converted Danish Trawler, I sensed an overwhelming feeling of panic and urgency amongst the crew. Even at full volume, I couldn’t make myself heard over the drone of the rotor blades. I looked out over the port quarter to see my wife smiling and waving from 60ft above us. 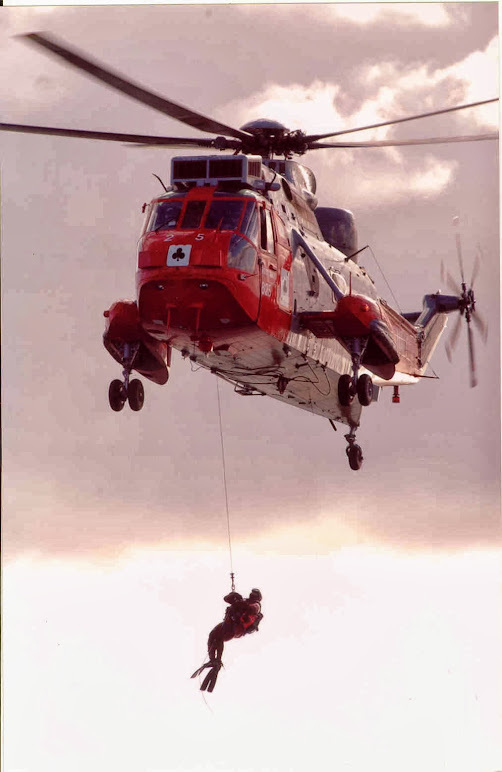 The famous red and grey ‘Search and Rescue’ Sea King Helicopter suddenly seemed larger than life, and although I had been fortunate enough to fly as a passenger in one before, its overbearing presence brought a whole new dimension to my experience. The crew had been fully briefed; the sails were down and we were motoring at close to full speed with the wind 40 degrees on our port bow. As the line was lowered towards us, my reaction became systematic, as if I was following an instructional manual on how to hi line from a helicopter. As I went through, one-by-one, checking off in my mind the ‘things to do’, it became obvious that the text books could not portray the noise, the confusion and the torrential spray caused by 8 Tons of metal, forcing a huge downdraught, causing the yacht and crew to behave in a way that I have never witnessed before. The line hit the water, essential to discharge any static, I gathered in the rope, coiling it into a bucket, reducing any risk of the line becoming fouled on the yacht, going overboard and wrapping the prop, or worst still tripping an already bedraggled and confused crew… I kept on repeating to myself, ‘Do not tie the line’. Although the hi line has a weak link, with a breaking strain of 150lb, you will not endear yourselves to your potential saviours by connecting them to your stricken vessel, as they only carry a limited number of high lines, and in a rough sea, the rise and fall with the swell would cause them to break. I pulled the line fairly taught, and down came the first crewman. At first all was going smoothly, however despite being briefed fully beforehand, the overwhelming urge was to not pull too tightly on the line, as if somehow I may be able to pull the helicopter out of the sky. The lack of tension caused the crewman to flail around, and resulted in a very clumsy boarding. The lack of backstay on the 60ft Gaff Schooner was a blessing as he climbed aboard. The small tender nearly broke off its davits as it took full impact of the 15 stone man, colliding like a giant conker. As the second guy descended, his colleague took control of the line, and he boarded with ease. I realised immediately my error – tension is your friend! The crewman’s safety lies with careful control of the line. 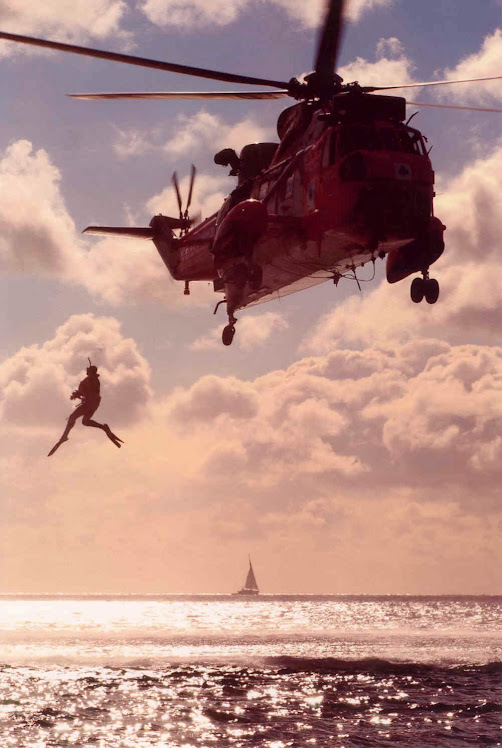 It is crucial that you are able to payout if the swell is causing an increase in distance between you and the helicopter, so as to avoid rope burn, however more commonly, not enough force is used to help bring the crewman in without him colliding into the yacht fittings. I was delighted to see the second crewman carrying a small bag, which turned out to contain the items we’d requested: Fresh bread, Milk and the day’s newspaper. This highlights another lesson learned, communication is not only extremely difficult between crew during the procedure, but also we found it impossible to talk to the helicopter crew prior to the exercise. Although both myself and my wife were able to use VHF channel 16, neither of us could be heard direct. You can imagine the surprise of Falmouth coastguard when I asked them to relay our request of fresh bread, milk and a newspaper to ‘Navy 193’, my wife’s call sign. Just to reassure the tax payer, she had already prepared our bag of goodies; although I quite like the thought of them landing outside the local corner shop on route to pick up our supplies. It added an unusual twist on my return from sea the following day, receiving usual greetings followed by an extensive debrief, highlighting my shortcomings. The whole experience proved invaluable to me, very few yachtsmen and women will have the opportunity to practice this exercise, until perhaps the service is required in an emergency. I am now able to pass on first hand experiences to my students, in the hope that should they ever require assistance from my wife, they will be fully prepared for the noise, confusion and potential chaos that comes with such a fast and efficient rescue service. Secure loose gear, well before the helicopter arrives: The down draught brings vertical storm force conditions! Only use red hand held flares or orange smoke – Never use parachute flares when the helicopter is close. Drop and secure sails and steer a steady course, usually with the wind 40 degrees on the port bow. Make sure crew are fully briefed before the helicopter arrives – you will not be heard once they arrive! Allow the line to hit the water first, otherwise you might get “zapped” (a static shock). Take up slack, and coil into a bucket – Do not tie the line! Keep the line taught, use two people if possible. When the crewman and casualty are lifted off, keep tension on the line to control their departure. Only cast the Hi Line clear when told to do so. A great post thank you for sharing. Here at Heli Operations we work with the world’s largest helicopter operators, providing helicopter crews, equipment, training and support to specialist operations, predominantly in the maritime environment and in the challenging Search and Rescue role. We look forward to reading future posts and wish you and your readers our very best.